My beautiful boy. I was unable to save him. The smartest doctors in the world were unable to save him. And then, I couldn’t bring him back. No matter how hard I cried, or what magic I performed, or how many letters I arranged. For so long…I couldn’t let go. To the awareness of how things really are. What does “to the awareness of how things really are” mean to you? ‘Things’ are fleeting, impermanent. My child’s heart, my grief, my life, this human race… It all passes away. Holding on to what I had-—-what I wanted most-—-is okay, normal. 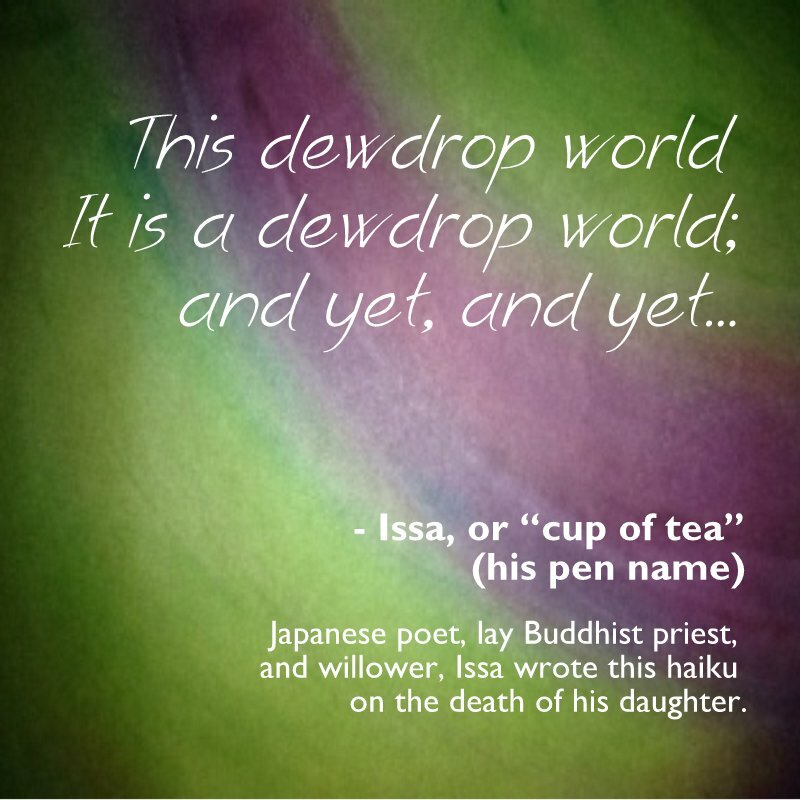 But then, I need to hear, “Enough,” so I can let go and return to living, now, while still in this dewdrop world. Thanks for your answer. I know what you write is true, but I still am having a difficult time accepting it. Perhaps, over time, I will struggle less with my resistance to this. However, although things are impermanent, it still seems so terrible that young lives can be cut so short. I wish I could believe that “even grief passes away.” I’m just not there…yet. I wish you peace. I hope this helps: I’ve written “Grief passes” and “Away” as separate sentences (in post), to keep the ideas apart. Perhaps grief never “passes away,” but “passes” into something else–the readjusting to living without our children, which continues for a lifetime, as suggested by the “Readjustment Model of Parental Bereavement” (see above menu when you can). Peace to you on this day, and on the very long road ahead. I will happily take that breath Deanna. Thank your for your thoughtfulness.